It’s safe to say Ezio Auditore is one of the most badass protagonists in video game history, but like his appearance in Assassin’s Creed: Revelations, the character itself was becoming old and worn out. Assassin’s Creed 3 offers its audience a new era, a new location, a new Assassin, and a brand new reason to fall in love all over again. As we continue to jump through history with about as much consistency as my ability to construct analogies, Assassin’s Creed 3 lands itself in the heart of Colonial America shortly before the liberation. You will play as Desmond, Connor and his father Haytham during the single player campaign which offers great insight into the main protagonist. The campaign is longer than previous but with a much more mature angle on storytelling it is by no means a hard task to complete as you are whisked from one jaw dropping moment to another. 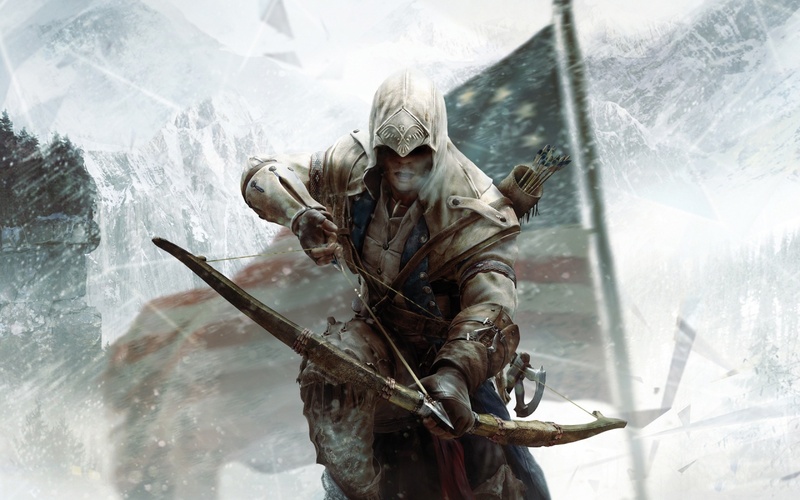 Because of the quality of the story within the Animus I often found myself rushing through Desmond’s sequences to get back to Connor on the Frontier – that isn’t to say the modern day story is bad, but it by no means meets the intensity of the American Revolution either. 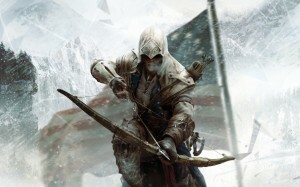 The multiplayer too fits nicely into the new setting, with Assassin’s Creed 3 continuing to offer a unique online experience with advanced performance tracking and Wolfpack, the new team-based game mode. The now prominent aspect of the Assassin’s Creed series has been expertly crafted in this latest installment, offering a refreshing change within the sea of gun-toting action that plagues the current generations multiplayer. The improvement from Assassin’s Creed: Revelations to AC3 is as big, if not bigger than the jump between one and two. Everything about the core gameplay is still here, it’s just better. As the game has been released on Ubisoft’s shiny new AnvilNext engine (eat your heart out Frostbite 2) it appears that the development team decided to go ahead and overhaul the game mechanics as well. The most notable changes to the gameplay are the increased emphasis on stealth – makes sense, considering you’re an Assassin and all; plus a third-person shooter style free aiming mode, given the increased use of guns in the more recent setting. The result is the feeling of playing Assassin’s Creed with the stealth of Splinter Cell along with the shooting mechanics of a Ghost Recon, but it’s presented in such perfect proportion that it doesn’t spoil the gameplay Assassin’s Creed fans know and love; it just makes the experience more awesome… It’s like if Jesus knew karate, imagine that. However the revitalisation doesn’t end there; Assassin’s Creed 3 is hands down the most visually stunning game I’ve ever played. For a game of its size, the attention to detail used through the Frontier is scary. Horse’s muscles flex and protrude from their legs as they carry their rider up a steep hill, branches bend under the weight of Connor as he glides among the treetops; I’ve even seen a character’s pony tail get caught on the felt of a jacket as its owner turned their head – for someone who appreciates the little things in video games, that almost made me cry. Our protagonist has also been in for a service, Connor has been decked out with over 5,000 new animations, and in fact the game in its entirety does not borrow a single animated step from any of its predecessors. As you play through Connor’s life you will watch him from stumbling through the forest as a boy, arms flailing as he tries to keep is balance, into becoming an agile young man and deadly adult. Unfortunately though, producing a game of this scale doesn’t come without technical issues. Textures pop in during large panning shots of the area, controls on horseback can be a bit inconsistent and guards occasionally get stuck or their movement pattern breaks. These issues are to be accepted in such a detailed open world game, but when glitches become an added obstacle in order to complete a mission objective it detracts from the immerse nature of the gameplay and can become quite frustrating, but I’m nitpicking. Overall Assassin’s Creed 3 is an absolutely sublime, awe-inspiring experience from start to finish. Addictive multiplayer will keep the game from leaving your console; but with visuals as stunning as AC3’s, why would you even consider playing anything else? At the point of this review glitches are still a problem, (albeit a minor one) but with issues fixable in a one month patch, Assassin’s Creed 3 is a very serious contender for game of the year.